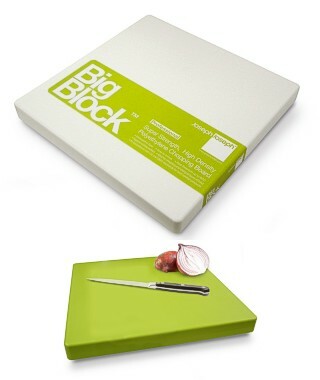 Made from HDPE high density polyethylene the Big Block ® chopping board is available in a range of eye catching colourways as well as a more formal white. HDPE has several advantages, but the most benificial are its abrasion resistance and self lubricating properties, which means that bacteria finds it difficult to breed and knives stay sharper longer. These boards are 30 by 30 cm (about 12 inches square approx) and 3 cm thick (1¼ inches) and have gripping feet for uneven surfaces.